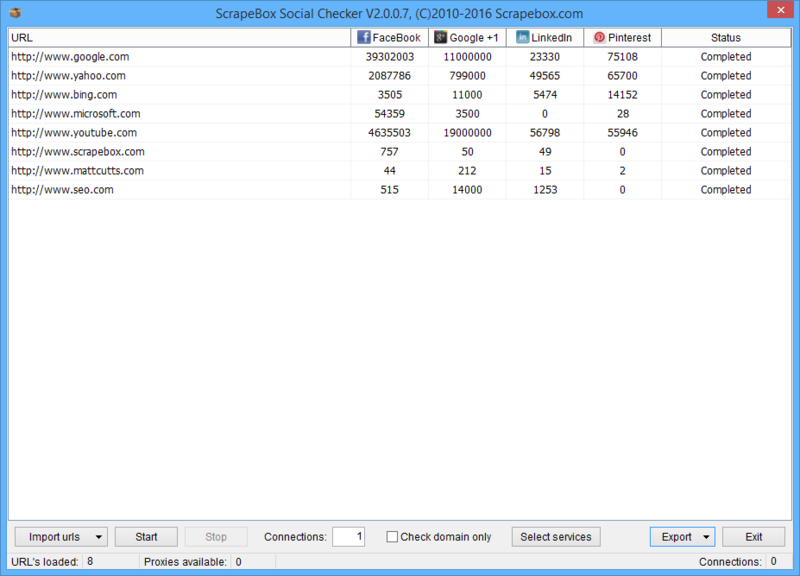 The ScrapeBox Social Checker Addon allows you to bulk check various social metrics from FaceBook, Google +1, LinkedIn and Pinterest. The web is getting more social, and social signals play an important role in your sites visibility to both search engines and customers and will likely gain more importance in the future. With the Social Checker Addon you can now monitor your sites social metrics, and your competitors popularity with 5 of the major social sites on the internet. The addon is especially useful for watching your sites social growth over time, comparing your site to your competitors or even checking the top search engine results to analyze how social signals may play a role in their rankings. The FaceBook count retrieves the number of FaceBook Likes, Shares and Comments. The Google +1 count gives the total number of +1’s given for the page, the LinkedIn count provides the number of times a URL has been shaed on LinkedIn.com and the Pinterest count provides the number pins for a given URL. The Social Checker addon is multi-threaded with adjustable connections to suit all internet speeds, with the option of checking the social signals of the loaded page or just checking the root domain. All results can be exported in multiple formats such as .xlsx, .xls, .csv, .txt, .tsv and many others. The Social Checker also includes proxy support, which can use a random proxy from your list for each request. There’s also an option for enabling or disabling individual social sites so you only need to check the metrics you are interested in. View our video tutorial showing the Social Checker in action. This is a free addon included with ScrapeBox, and is also compatible with our Automator Plugin.